Posted by Katie in features. Okay, so this one is easy to guess where I’m reading! It’s right under the Christmas tree. I’m reading “Darklight” which I got for Christmas. You can see my review here. And another addition of “Where I Read!” This is my favorite picture so far. So, haven’t had one of these posts in a while. This was taken way back in October during the 24-Hour-Readathon. I was waiting for my friend to pick me up at Loyola in Chicago and happened to glance up at the sky and it was gorgeous. I really miss warm weather now! I’m reading “Ballad” by Maggie Stiefvater in the picture. You can check out my review here. And a fairly exciting post this time (at least the location is), however I just couldn’t get a good enough picture in one this time around. So you get two clue pictures. In a bizarre twist, I wound up going to Brookfield Zoo in September for my friend’s wedding. Between the ceremony and reception we got to wander around the zoo while the wedding party took pictures. That’s when I wound up doing a little bit of reading by my favorite exhibit — the dolphins. In the pictures, I’m reading “Viola in Reel Life.” You can check out my review here. Okay, it’s been a while since I had a post, and I swear posting will return as scheduled after NaNoWriMo is over. But! I have a new “Where I Read” that’s less exciting than normal, but still a large part of where I actually do most of my reading. Yep, you might have guessed it — in the car. That’s me, immediately following a Borders trip. You can see copies of Poison Study and Suite Scarlett over there, and I think I can make out “My Most Excellent Year,” and there’s another two books under there somewhere. 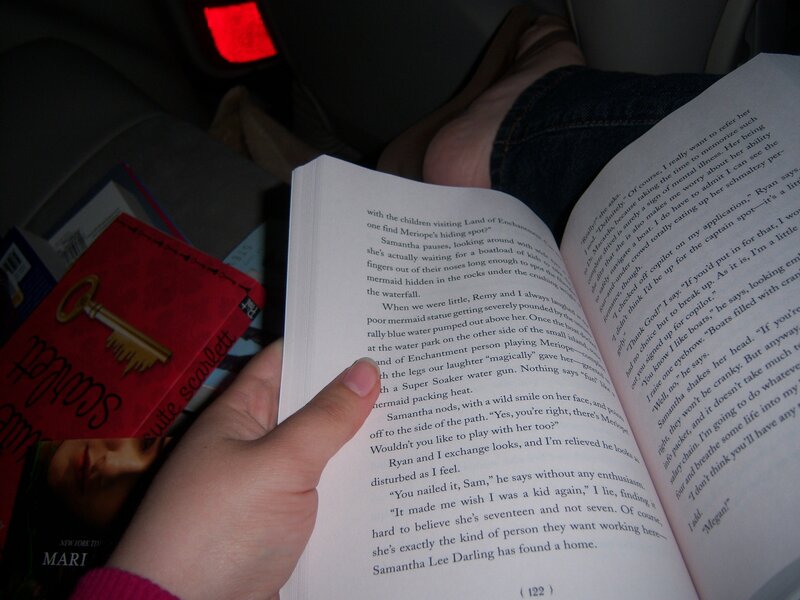 I love reading in the car and am so glad that I’m not a motion-sickness person. I don’t know what I would do if I couldn’t read in the car. And I’m reading Devoured by Amanda Marrone in this picture. You can read my review right here. A sometimes feature on my blog…I live in a pretty awesome place (Chicago) and I read in some pretty neat places. And I want to show you where I get to read. I’m finishing up the very late pages of “Rampant” after taking the CTA to Wrigley Field back in September. Couldn’t put it down, so I had to watch the game and read at the same time. I’ve spent a lot of my life growing up at Wrigley. We’ve been shared-season ticket holders since I was an infant. And I just love baseball in general. You can check out my review of “Rampant” here. I’m been shooting around this idea for a while (and stockpiling some interesting photographs). I live in a pretty awesome place (Chicago) and I read in some pretty neat places. And I want to show you where I get to read. I’m reading “Prophecy of the Sisters” on the beach by Lake Michigan. This was in August. Obviously, it’s not beach weather right now in Chicago. So, my though is that I’ll update this feature whenever I get an interesting picture and after I post that book’s review. Right now I’m not planning for this to be a regularly scheduled thing. But we’ll see. You can read my review of “Prophecy of the Sisters” here.